Chicago is the third largest city in the United States and a happening place with any number of things to do when it comes to taking in culture, sports, and shopping. A city that is diverse enough to have something literally for everyone. Having stepped well past its image in the early 20th century as a haven for organized crime the windy city now is a place that visitors come to have a roaring good time. Things to do in Chicago include. People form Chicago are true lovers of sport and take their sports teams pretty seriously. 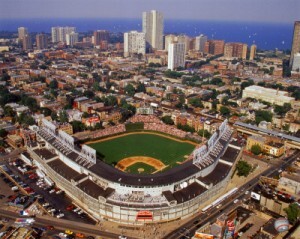 For a real taste of Chicago culture head north of the Loop to Wrigley Field to watch the Chicago Cubs play. Wrigley field is one of those ball parks that true baseball fans appreciate; it really is one of those ball parks that all fans must visit one day. There are also tours of Wrigley Field that offer tours that include peaks into the dugout, the press box and the Cubs Clubhouse. Tours cost $25 dollars. Just to the north of the Art Institute of Chicago is Millennium Park which is home to many of Chicago’s best and favourite sights. Beloved sights include Cloud Gate, often called “The Bean” and Crown Fountain, which features two giant column screens that display the faces of 1,000 Chicago Residents with the faces changing every few minutes. The park also is home to Prizker Pavilion Theater and Lurie Garden. Lincoln Park Zoo is one of the most beloved treasures in Chicago and is home to numerous different wild life species. Designed to simulate their natural habitats visitors can see gorillas playing in a sprawling environment, a penguin and seabird house to see puffins and razorbills. Youngsters will enjoy the Farm in the Zoo, where children can play with farm yard animals, or the Conservation Station which features hands on demonstrations for how to care for animals in the zoo. The Lincoln Zoo is open daily from 10 a.m. to 5 p.m. and admission is free. If you have gotten to Chicago and you want to do a little big city shopping the Magnificent Mile is the place to go. Filled with high end stores like Saks Fifth Avenue, Macy’s, Lord & Taylor, Neiman Marcus mixed in with some smaller boutiques there is lots of opportunity to find the perfect outfit or just window shop. Lovers of architecture will also appreciate the variety of different styles of building flanking the street. Bear in mind if a more bohemian and independent shopping experience is what you are after you can also head down to Bucktown or Wicker Park.